Over twenty years ago, I served as Project Officer for a national teacher professional development project for the Australian Association of Mathematics Teachers, working with representatives of each of the state and territory Mathematics Teacher Associations to explore and develop resources for the new phenomenon of the World Wide Web. Of the outcomes of the AAMT EdNA DAME project (Yes, Will Moroney, I am looking at you for that name!) [Education Network Australia Delivery Alternatives for Mathematics Education], two in particular retain a special fondness for me. Here I present some of the best free browser-based classroom-ready teaching and learning tools for mathematics and STEM. Feel free to use them and share them with your students. GeoGebra is an exciting blend of Algebra and Geometry using an integrated graphing and geometry environment. It is freely available for all platforms and has a wealth of supporting sites. Explore the sample files below. The GeoGebra documents that you create can be embedded in a web page. AND your students can interact with those applets from the web page, allowing you to create dynamic worksheets, which might be used for feedback or assessment! Platonic Solids and Spheres (GeoGebra 3D). Making Algebra Meaningful with Technology. Accelerometer, Gyroscope and Magnetometer are exciting and important tools for exploring motion and orientation in a variety of ways, and it is surprisingly easy to create web pages that support the observation, collection and manipulation of data from such sources. While desktop computers may not lend themselves to this domain (yet!) phones and tablets are the perfect tools for students to explore the science and mathematics of motion! 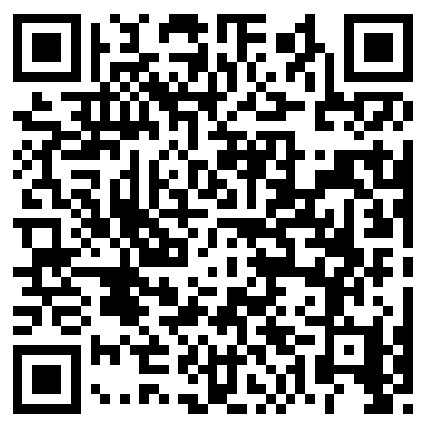 QR Codes are an excellent way to share data and information with those around you. Most commonly used to share web links, they can also be a quick and convenient way to transfer data with colleagues or even assessment responses between students and teacher. Heart rate monitors were among the earliest adopters of Bluetooth Low energy technology, and so it is not surprising that there are (relatively) simple solutions for offering these great tools within a web page. The BLE heart rate script transmits a value using the Bluetooth SIG Heart Rate Profile and should work with most common heart rate monitors. Once again, we combine the BLE sensor with GeoGebra's graphing and spreadsheet capabilities to develop your own personal fitness trainer. You might also like to try a combination of Web Bluetooth, GeoGebra and music using Mike Bostock's amazing arc piano! Explore the mathematics and STEM basis for music with this free online tool! If you would like to use GeoGebra as a tool for STEM, then what about pairing it with the amazing data collection available using the TI CC2650 SensorTag? The TI SensorTag is a small, inexpensive device which packs a powerful punch - it is a BlueTooth Low Energy (BLE) tool with sensors for temperature, humidity, barometric pressure, accelerometer, magnetometer, gyroscope and more. Used with the Chrome browser on Mac, Windows (Chrome Canary), Android or ChromeBook, students can easily collect, view and analyse a wealth of real world data for mathematics and science, from the middle years through to seniors. From building their own weather station, to exploring the mathematics and physiology of exercise and dance the opportunities for rich mathematical exploration are truly exciting. All in a tiny device that fits in your hand and costs around $AUD40! Another great STEM application can grow from students learning to code for MicroController Unit (MCU) boards, like the TI LaunchPad series or Arduino boards. We can now use Web Bluetooth to enable free and effective communication with these programmed boards, using the Chrome browser on Mac, Windows (Chrome Canary), Android and ChromeBooks or WebBLE app for iOS! Coupled with the versatile mathematical capabilities and programmability of GeoGebra, students can control these boards remotely, using them to collect and analyse data, even to control BLE robots! Step-by-step tutorials lead from beginner to robotics developer! What if you had a BLE-enabled LaunchPad and access to either mobile device internal sensors, or even a TI SensorTag - what could you do? Actually - quite a lot, but one application that springs quickly to mind would be to use an accelerometer to drive your LaunchPad robotic vehicle! In this example, we use the 3D accelerometer on either the internal device sensors or the SensorTag to send the forward, back, left and right commands to the sketch on board the robot - and it is So. Much. Fun! Just connect the LaunchPad robot and either internal device sensors or SensorTag, tap the "Drive Using Accelerometer" button and practise your remote control skills! OR... Just connect your LaunchPad, tap the "Drive Using Accelerometer" button and use the acc_x and acc_y GeoGebra accelerometer sliders to control your Robot! All these LaunchPad BLE documents should work well using the Google Chrome browser on a recent Mac (mid-2012+), Windows 10 with Chrome Canary, Android device or ChromeBook. LaunchPad BLE (but NOT TI SensorTag!) will work on iPad with the WebBLE app, but this is an experimental build and may not always work seamlessly. For example, I find that I need to CONNECT, then DISCONNECT, and then CONNECT again to establish a reliable connection using WebBLE. However, after this, it generally works well. The latest versions of Chrome (69+) have these features enabled by default. Back when I started exploring, I got mine running on my Mac without too much trouble: I did go in and switch on Chrome's experimental flag to support Web Bluetooth but this was pretty straightforward. You can enable it turning on the enable-experimental-web-platform-features flag: In the Chrome browser, type in the web address chrome://flags/. This action results in a list of experimental browser features available to you. You want the Web Bluetooth one. The simplest solution is probably to download Chrome Canary for your platform, which is their beta software, enabling pretty much everything by default. If you have any questions or would like to share your experience with these utilities, please drop me an email! Would you like to be able to quickly and easily create interactive mathematics and STEM resources for your students? Live documents that can be freely accessed on any device or any platform with Internet access? The tutorials in this series offer a quick and easy way to get started creating your own web-based resources, even if you are a complete beginner! Each lesson is designed to take only a few minutes, with the option to explore further if desired. 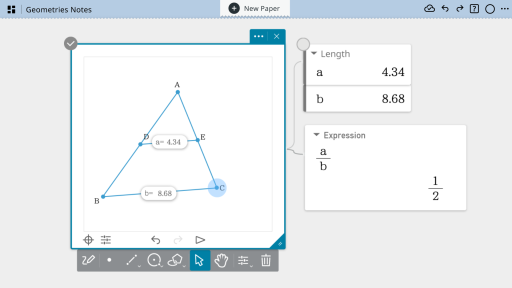 The first lesson offers a taster of what lies ahead - from the simplest of web pages to adding the power of GeoGebra - graphing, computer algebra, dynamic geometry and interactive statistics - to your own lessons and activities! Later lessons will add access to mobile device internal sensors and BlueTooth Low Energy (BLE) capabilities to these Live web pages, supporting active engagement with key STEM principles and the ability to develop engaging activities for students. GXWeb is a free browser-based symbolic geometry tool that combines constraint-based dynamic geometry with computer algebra. From Saltire Software who offer the amazing Geometry Expressions and Mathematical Illustrations, this surprisingly powerful tool for classroom learning offers students a pathway to learning and understanding algebra through visual and dynamic geometric representations. Imagine dynamic geometry built on a foundation of computer algebra. So side lengths, angles, etc can be defined algebraically as well as numerically, and results can be derived in general form. Then add constraint-based construction to make it even easier to use. Do you want a right-angled triangle? No problem - just define a general three sided figure and add the right angle later. Have students explore algebraic relationships through convincing visual means using geometric constructions. Try GXWeb out right here by tapping on the button or the figure above - don't forget to explore the help options to get started! Check out my YouTube collection of great GXWeb examples! Imagine being able to physically grab, drag and drop the elements of mathematics - arithmetic, algebra, geometry and statistics! This is classroom technology assisting learning in the best possible way - intuitive and powerful interactions between students and the mathematics they are learning. The two examples featured here demonstrate beautifully the potential of good classroom technology to enhance and transform the learning process. DudaMath is an integrated environment for interactive exploration of mathematical concepts and problem solving. Graspable Math allows students to explore algebra online. Move terms fluently to solve equations and explore the power of algebra without the frustration for free! Like DudaMath, students are empowered to explore the concepts behind the manipulations. I was pleasantly surprised by the feature set of this free web resource from CASIO. 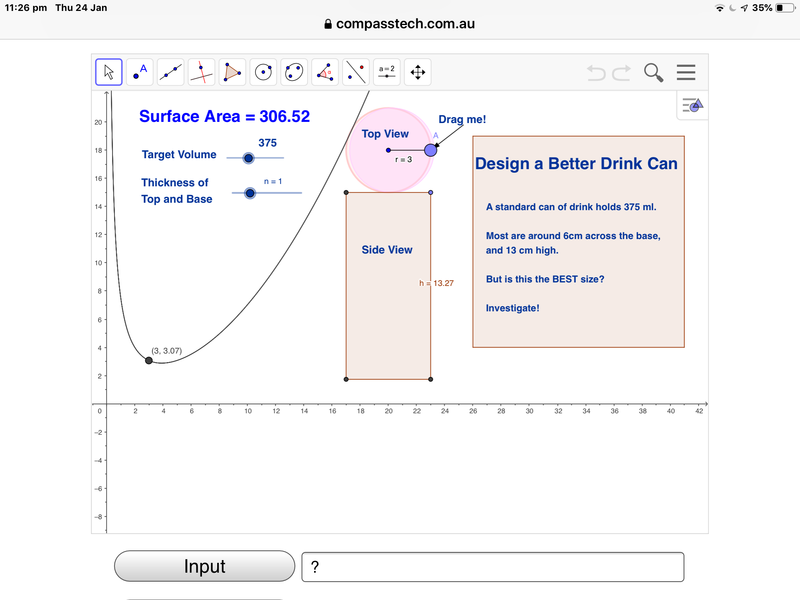 Not quite up to the high standard set by GeoGebra, no integrated graphing and geometry, and a requirement to pay for the complete (CAS) functionality, but a very clear and easy to use mathematical workspace for students. ClassPad.net offers mathematical functions required for education, and various graphing capability. The simultaneous display of graphs and a slider function helps deeper understanding of mathematics. A Spreadsheet can be used in combination with a graphing function to draw statistical graphs. It allows you to analyze statistical data using various approaches within a single screen. You can create freehand graphics using the Geometry functions including the ability to freely alter the shape of graphics and automatically calculate length, area, angle and so on. Check out the ClassPad.net YouTube video. 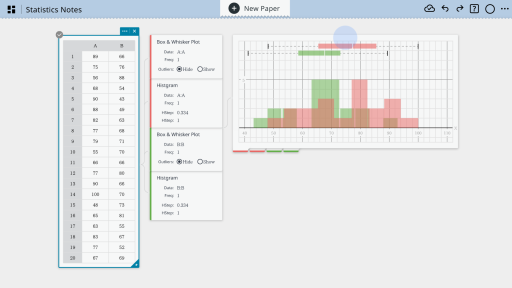 Graph functions, plot data, evaluate equations, explore transformations, and much more for free! 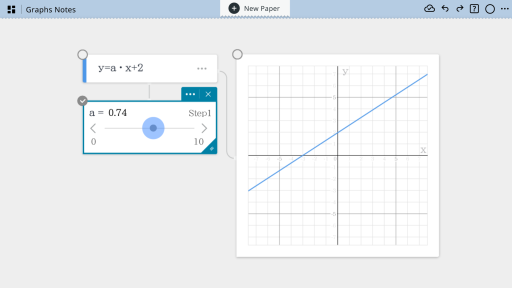 While Desmos does not offer the integrated algebra and geometry of GXWeb or GeoGebra, it does offer a functional geometry app. Of perhaps more interest is the option for students to collaborate, viewing and sharing each others' screens while working on Desmos.